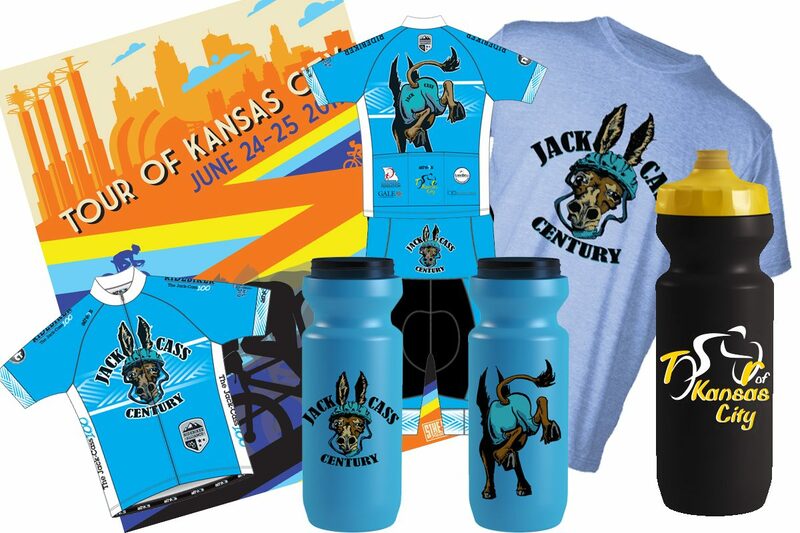 We will have plenty of great items for sale this year as part of the 2017 Tour of KC and Jack-Cass Century. You will have the opportunity to purchase our Jack-Cass 100 and Tour of KC items at both the fondo and race events while supplies last. We will have the best water bottles made, Specialized Purist water bottles, in limited quantities. Both the Jack-Cass and Tour of KC Logo bottles will be available at the fondo and if any are left, we will have them at the race events. Don’t miss out on this year’s Jack-Cass 100 shirt. This whimsical shirt will sell out fast and sizes are limited so grab one while you can. Some riders have already ordered their kits and we will have just a few kits in a few sizes available on ride day to try-on and purchase. You can order your jersey, bib, or shorts at any time in our ONLINE STORE. These will ship to your home about 4-6 weeks after you place your order. We will have order forms onsite on the day of the event where you can purchase your jerseys or shorts and then we will submit the orders for those riders who want one at the event. These will all be delivered to your home as well, 4-6 weeks after the event. Each year, we are having a local artist design a new poster for the Tour of Kansas City. This year’s artist is Phil Shafer aka Sike Style. Those of you who come out and race or watch the Crossroads Criterium will see some of his street art around the course. You can check out this ARTICLE about one of his latest projects, in partnership with the Kansas City Royals, “Raised Royal”.